Once upon a time our 12 year old fridge died. Just up and died after living a long life of keeping it cool and flooding our kitchen three times. I was ready to be rid of it but perplexed as to why it died. Well as we were moving it out of the way for the new fridge, I noticed something. The bottom of the refrigerator, where the coils are, was filthy. Being the clean person, I cleaned those coils, plugged the fridge back in and it came back to life! *Facepalm* just bought a new fridge and I don’t want to return it. Well now the old fridge is in the break room at work and I have a new one at home. 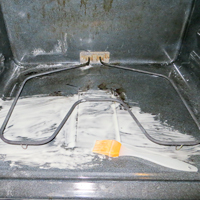 Anyhoo, moral of the story: Keep the Refrigerator Coils Clean. A good sign that they might need a cleaning is if your fridge is not as cold as it used to be. Here’s How to Clean the Refrigerator Coils. You’ll be amazed at how much dust is down there. Step One: Turn fridge off and remove grill at the bottom of the fridge. It should just pop off. Step Two: Use the crevice tool on your vacuum and vacuum up dust/debris from the coils. Step Three: Remove remaining dust with a refrigerator cleaning brush and vacuum dirt/dust. Step Four: Clean grill and put it back onto fridge. Clean the refrigerator coils every few months or so to keep your fridge cool. Not to mention it might lower your energy bill because the fridge won’t have to work so hard to keep your food cold. Happy Cleaning and Happy New Year! I clean my house once a month, but to clean absolutely everything (including fridge, washing machine, freezer…) it is twice a year, sometimes I don’t think that is enough. twice a year I clean my fridge, I will note about the Refrigerator Coils as you mentioned here. Tks.